The McLaren Longtail just a got a new big brother and he’s bigger, tougher and more intense than anything we have ever seen. The 675LT Spider was revealed along with five other new models at McLaren Automotive in 2015. The impressive line-up included McLaren P1 GTR, 570S Coupé and 540C Coupé, and the fixed-head 675LT Coupé -- reinforcing the impressive McLaren’s Super Series range. So if you had a spare $372,600 USD and you acted fast, you may have been lucky enough to be one of the 500 customers who are set to get their hands on this limited edition. It is easy to see why this model flew off the shelves. The 675LT Coupe appears weightless as it uses uncompromising technology and aerodynamics to make it the fastest and most thrilling open top model to date. There’s no need to stop the vehicle if you want the roof down. Even travelling at speeds of 30km/h (19mph), the three-piece retractable folding hardtop can be opened, allowing you to really appreciate the aerodynamics of the car. The first Longtail introduced in the late 1990s had an emphasis on weightless and refined performance. The 675LT Spider continues this theme with extensive use of carbon fibre throughout the bodywork. For continued aerodynamics, like the 675LT Coupe, it has a larger splitter and end plates, front under body, side skirts, side intakes, lower side intakes, rear body side lower, rear fenders, rear deck, rear bumper, diffuser and ‘Longtail’ Airbrake are all carbon fibre. The powertrain and chassis are lighter, culminating in a dry weight of just 1,270kg. This makes the 675LT Spider 100 kg lighter than the 605S Spider resulting in dramatic power-to-weight figure of 532PS per tonne. The chassis is already strengthened by the carbon fibre MonoCell meaning more weight savings. 675LT Spider is only 40g heavier than the Coupe due to the retractable roof system. If you prefer the exterior paint pallet of the 675 Coupe, the same is also available in the Spider which has also seen the new Chicane Grey, Napier Green, Delta Red and Silica White paint finishes. If you want Spider exclusivity, then look no further than the Solis paint scheme. ‘Solis’ is Latin for sun. The colour is rich and regal and enhances its exclusivity as it’s only available to the open top 675LT Spider. If you like detailing then opt for the Club Sport Professional Pack which uses carbon fibre to enhance existing features. With an impressive choice of wheel finishes from Titanium Silver, Storm Grey, Onyx Black and Chicane Grey, you are spoilt for choice. The front wing end plates have a satin carbon fibre finish lower side air intake and the centre of the rear bumper, along with the side intakes, wheel arches, wing mirrors and ‘Longtail’ Airbrake. The striking McLaren Orange colour is woven inside and out of the car, harking back to the Formula 1 and Can-Am racers of Bruce McLaren – the brake callipers and embossed leather and stitching detail throughout. Whilst we have focused on the similarities between the Coupe and the 675LT Spider, there are some differences. Firstly, there is a clear lack of the Club Sport Pack which consists of four point harnesses, fire extinguisher and titanium roll hoop. These features have been dispensed with for weight saving purposes. But as with all Longtail vehicles, exclusivity is the name of the game. 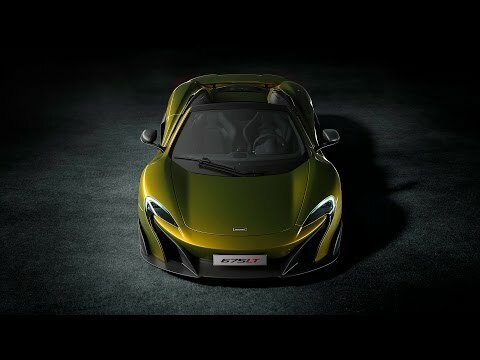 Just like the Coupe, a mere 500 examples of the 675LT Spider will be produced. A delivery date of summer is expected for this small elite group of satisfied car owners. McLaren 675LT Spider has been designed with aerodynamic performance in mind. The front splitter has been extended and is flanked by front wing end plates to increase downforce and work the airflow harder. The sculpted sills of the carbon fibre doors seem to liquefy over the lower edge of the bodywork leading to a smaller intake of air at the rear wheels. The side intake of air is more substantial. It draws clean and cooling air to the radiators, helping the machine maintain an optimum temperature. When the roof is extracted it is stored below a colour coded tonneau cover and attention is drawn to the engine because of the statement lightweight vented polycarbonate engine cover. The Longtail Airbrake has doubled in size and sits below the lightweight titanium crossover twin exhausts. Although heavier, the additional weight that the brakes bring is reduced by the fact that the rear wings are made of carbon fibre construction. Across the rear deck and below the rear wing, the bodywork is uncovered which enables the engine to remain cool. Meanwhile, the louvres in the flared rear bumper optimise pressure levels. The 675LT Spider has the same suspension and shape as the Coupe. The track is wider, having increased by 20 mm and there are new lightweight springs at the front end of the vehicle. Spring rates are the most impressive out of the Super Series models as stiffness has increased by 27 percent at the front and 63 percent at the rear, resulting in more rear balance and a 40% rise in downforce. The 675LT Spider comes as standard with 19 inch front and 20 inch rear wheels. These are the lightest wheel and tyre set McLaren has ever made available. Ultra- lightweight alloy is used. Working in partnership with Pirelli, P Zero Trofeo R tyres were developed to ensure increased traction and maximum road grip. There’s the option to customise these wheels by choosing between the five-spoke Super-Lightweight design as seen on the Coupe or the 20 –spoke design -- both with diamond cut or liquid metal finish. The interior of the vehicle continues with the weightless theme. Alcantara is used minimally and raw carbon fibre ensures further savings on weight. Copying the style of the McLaren P1, there are twin lightweight carbon fibre shelled racing seats resulting in savings of 15 kg of weight. ‘675LT’ is embossed into the fabric. Sitting in the seats gives a feeling of being cocooned and invincible, ready for speed. Another highlight of the McLaren P1 is that its touch screen is centrally mounted as are the heating and ventilation controls. The Meridian four speaker audio system is also controlled from this panel and all air conditioning has been removed we think on the assumption that the aerodynamics will help the driver keep cool as you travel at a fast speed. A 16 kg system can be requested without additional charges. The 675LT Coupe brought the ‘By McLaren’ theme and this is replicated in the 675LT Spider model. The range of interior choices has been extended with an exclusive Xenon Yellow contrast stich just for the Spider. With a meaty 3.8-litre twin turbo V8 powertrain taken from the coupe’s younger brother, the power output and torque figures remain the same at 675 PS (666 bhp) delivered at 7,100 rpm and 700 Nm (516 lb ft) available between 5,000-6,500 rpm. But changes to the powertrain resulted in half of the components being replaced to optimise power and performance. The cylinder heads and exhaust manifolds have had attractive redesigns, the turbos are more efficient, there’s a faster-flowing delivery system and fuel pump, the camshaft has been replaced, and lightweight connecting rods are used. When you look at the performance figures, you can see what impact these changes have had. Capable of accelerating from 0-100 km/h (0-62 mph) in an eye blinking speed of 2.9 seconds, it can also reach a speed of 200kmh (124mph) in 8.1 seconds. This is only 0.2 seconds shy of the lighter and aerodynamically adjusted coupe. Maximum acceleration is achieved by controlling torque delivery in first gear and it manages torque to 600Nm (443lb ft). This provides for maximum acceleration and significantly reduces wheel slip with a dramatic top speed of 326km/h (203mph). The 675LT Spider returns 24.2mpg on the EU combined cycle, while CO2 emissions remain at 275 g/km (similar as that of the coupe). McLaren Automotive has revealed the latest chapter in the history of the iconic 'Longtail' name with confirmation of the 675LT Spider. Strictly limited to only 500 examples worldwide, it is only the second model to wear the LT badge, nearly 20 years McLaren resurrected the name, and is in response to significant customer demand. The 675LT Coupe focused on light weight, enhanced aerodynamics, increased power and track-focused dynamics, and this limited-run model quickly sold out before the first deliveries commenced. Sharing these key characteristics, McLaren Automotive now presents the most focused, fastest and exhilarating open top model to ever wear a McLaren badge. The 675LT Spider, priced at $372,600 USD, is the fifth new model debuted by McLaren Automotive in 2015 in what has become a defining year for the British brand. This latest model joins the McLaren P1™ GTR, 570S Coupe. 540C Coupe and the fixed-head 675LT Coupe as new to the line-up, and further strengthens the Super Series range. Under the skin of the 675LT Spider sits the heavily revised 3.8-liter twin turbo V8 powertrain from the Coupe sibling, ensuring performance figures are worthy of the LT – or 'Longtail' – badge. The power output and torque figures remain unchanged, with 666 hp (675PS) delivered at 7,100 rpm and 516 lb-ft (700Nm) available between 5,000-6,500 rpm. The changes to the powertrain saw more than 50 percent of the components replaced to ensure optimized levels of power, torque and drivability. These include new, more efficient turbos, detail design changes to the cylinder heads and exhaust manifolds, new camshaft and lightweight connecting rods, and a faster-flowing fuel pump and delivery system. Acceleration from 0-62 mph (0-100km/h) takes just 2.9 seconds, and 124 mph (200km/h) is achieved in 8.1 seconds – giving away only 0.2 seconds to the more aerodynamically optimized and lighter Coupe. Controlled torque delivery in first gear manages torque to 443 lb-ft (600Nm) to ensure maximum acceleration, and minimizing wheel slip. Top speed is 203 mph (326km/h). Despite these blistering performance figures, the 675LT Spider returns an EPA-rated 18 mpg in combined city/highway driving, while CO2 emissions remain at 275g/km – the same as the Coupe. A three-piece retractable folding hardtop can be opened at speeds up to 19 mph (30km/h) to allow for a new level of open-air exhilaration. Staying true to the 'Longtail' ethos, established by the McLaren F1 in the late 1990s, the 675LT Spider has been developed with a focus on light weight and optimized aerodynamic performance. The special nature of the model is supported by the extensive use of carbon fiber for the bodywork. As with the 675LT Coupe, the front bumper with larger splitter and end plates, front under body, side skirts, side intakes, lower side intakes, rear bodyside lower, rear fenders, rear deck, rear bumper, diffuser and 'Longtail' Airbrake are all carbon fiber. Lightweight components are also found throughout the powertrain and chassis, all contributing to a dry weight of just 2,800 lbs (1,270kg). This weight is a full 220 lbs (100kg) lighter than the already lightweight 650S Spider, and gives a power-to-weight figure of 4.2 lbs per hp. Due to the inherent strength of the carbon fiber MonoCell chassis, no further strengthening – and associated weight increase – has been added through the removal of the roof, and the 675LT Spider is only 88 lbs (40kg) heavier than the Coupe, all due to the retractable roof system. The dramatic styling and purposeful stance of the 675LT is retained with the Spider variant, with the extended front splitter flanked by front wing end plates, each working the airflow harder and increasing downforce. Sculpted carbon fiber door sills run along the lower edge of the bodywork, flowing in to a smaller air intake ahead of the rear wheels. This sits below the more pronounced side intake, with both feeding clean, cool air into the side radiators which are more prominent to offer increased cooling. The retractable hard top stows below a color-coded tonneau cover, and the engine remains visible through a lightweight vented polycarbonate engine cover. At the rear, the lightweight titanium crossover twin exhausts exit below the active 'Longtail' Airbrake which is 50 percent larger than other Super Series models. This is integrated into the design of the flowing rear wings and despite the larger size, carbon fiber construction ensures weight is actually reduced. Exposed bodywork across the rear deck and below the rear wing aids engine cooling, while louvers in the flared rear bumper optimize pressure levels. The 675LT Spider shares the suspension set up and geometry of the Coupe, with the front end sitting on new lightweight springs and a wider track – increased by 20mm. Spring rates are the most track-focused of the Super Series models, with stiffness increased 27 percent at the front and 63 percent at the rear, providing a more rearward balance and allowing for a 40 percent increase in downforce over the 650S Spider. As standard, the 675LT Spider is fitted with 10-spoke Ultra-Lightweight forged alloy wheels – 19-inch at the front, 20-inch at the rear – and P Zero™ Trofeo R tires, developed for the 675LT models in collaboration with technical partner Pirelli. These are the lightest wheel and tire set ever offered by McLaren. Two Super-Lightweight wheel options are optionally available; a new 20-spoke design, offered in liquid metal or diamond cut finishes, and the five-spoke Super-Lightweight design which debuted on the Coupe. The lightweight theme continues throughout the interior with Alcantara® and bare carbon fiber used extensively. A pair of lightweight carbon fiber-shelled racing seats, modelled on those fitted to the McLaren P1™, save a combined 33 lbs (15kg), and feature '675LT' embossed leather to provide enhanced levels of support and grip. As seen in the McLaren P1™ and 675LT, heating and ventilation controls are located within the portrait-orientated, centrally-mounted touchscreen, which also operates the four-speaker Meridian audio system, while air conditioning has been removed. The 35 lb (16kg) system can be specified as a no-cost-option. The 'By McLaren' interior themes were first introduced on the 675LT Coupe, and are again available for the Spider model. The range is extended for the 675LT Spider, with the addition of exclusive Xenon Yellow contrast stitch. Simialrly, the full exterior paint palette offered on the 675LT Coupe is available for the Spider model, which includes the new Silica White, Delta Red, Napier Green and Chicane Grey paint finishes. In addition, the newly developed deep golden color, Solis – which derives its name from the Latin for sun – is a bespoke color only available on the open-top 675LT Spider. Further enhancements can be made through the Club Sport Professional Pack, which adds further visual carbon fiber and stealth detailing. Available in Titanium Silver, Storm Grey, Onyx Black and Chicane Grey, the Ultra-Lightweight wheels are stealth finished, while a satin carbon fiber finish is applied to the front wing end plates, lower side air intake and the center of the rear bumper, along with the side intakes, wheelarches, wing mirrors and 'Longtail' Airbrake. McLaren Orange detailing is then applied both externally and internally, with brake callipers, embossed leather and stitching all in the heritage color made famous by the Formula 1™ and Can-Am racers of Bruce McLaren. Another key characteristic of any Longtail is exclusivity, and the 675LT Spider is no exception. As with the Coupe, production of the 675LT Spider will be strictly limited to only 500 examples, with first deliveries in summer 2016. While the name and basic architecture remained the same, the 1997 McLaren F1 GTR 'Longtail' – or LT – was completely re-engineered from the ground up, and was the ultimate version of the iconic McLaren F1. With enhanced levels of downforce through extended bodywork, and dramatic weight savings, the end result was the most track-focused derivative of all 106 models to wear the McLaren F1 badge. The McLaren F1 GTR 'Longtail' raced successfully during the 1997 sports car racing season, including most prominently in the FIA GT championship against specially developed racing 'prototypes', and went within a whisker of winning the world title. Notable achievements included victory in the Silverstone 4 hours, the Hockenheim 4 hours, the Spa 4 hours and a 1-2 class finish – 2-3 overall – at the 1997 24 Hours of Le Mans. Despite racing against the much quicker LMP cars, only one lap separated the #41 McLaren F1 GTR 'Longtail' from outright victory. The nearest opposition in the GT1 class finished nearly 30 laps behind. And so, McLaren has done it again. 'LT' is now the ultra high-performance brand, re-establishing the McLaren 'Longtail' heritage. With two models now wearing the iconic badge, the 675LT Coupe and 675LT Spider embody the 'Longtail' ethos, with a focus on light weight, enhanced aerodynamics, increased power, track-focused dynamics and driver engagement.